The New Zealand government – led by autocratic Prime Minister Wynyard Nairn – approves the establishment of a USA naval facility, and in the middle of Wellington’s pristine harbour. Given the anti-nuclear stance in the country, all hell breaks out! Daily protests and rallies occur and threats of mayhem are made. 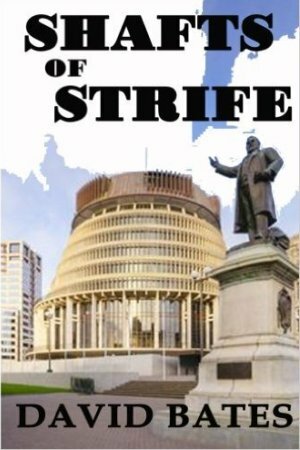 Within days anarchy rules; Parliament is occupied, the US Embassy is attacked and two die, a major TV communications tower is destroyed and central Wellington is blockaded. But when the International Airport is forced to close, the situation reaches crisis point. The Prime Minister – under increasing pressure from the scale of continuing protests – attacks the Police, threatening to remove their independence and bring in the army. Will Nairn change his mind, is he even listening? … or will it be up to the people? A story of democratic power and protest! New Zealand's decision to declare itself nuclear-free in 1987 created quite a stir at the time, so it makes considerable sense that an autocratic Prime Minister approving a US Navel facility in the middle of Wellington harbour (and therefore allowing the possibility of nuclear powered vessels back into New Zealand waters) would create an even bigger stir. SHAFTS OF STRIFE is built around that concept - where daily protests and rallies occur, mayhem and anarchy ensue and, well all hell breaks out as the blurb says. The novel builds a picture of an authoritarian Prime Minister, hell bent on what seems like a ridiculous direction, in the face of absolute opposition from most sides. Unfortunately there's something soberingly real about the scenario put forward. Unfortunately, an idea that doesn't quite hit as hard as it should, due in part to a tendency towards expository style with big info dumps, and a simplistic "bad politicians" versus "good cops" underlay. Well worth a look though - especially as a reminder that there is a world of difference between an autocrat and a strong leader.